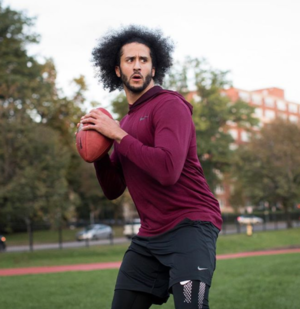 Colin Kaepernick is a NFL quarterback for the San Francisco 49ers who made headlines when he began sitting or taking a knee as the National Anthem played in the stadium during the 2016 football preseason. The mixed race athlete was using his notoriety to give voice to the voiceless. He was making a political statement about racism, oppression, and police brutality in America by opting out of the “Star-Spangled Banner” prior to games. Other athletes followed suit in solidarity, but Kaepernick faced threats and backlash from critics. 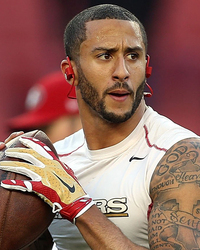 Kaepernick was born on November 3, 1987 to white biological mother Heidi Russo in Milwaukee, WI. He was adopted and raised by Teresa and Rick Kaepernick, a white couple, in Turlock, CA. He attended the University of Nevada and is the founder of the Colin Kaepernick Foundation to fight oppression. Colin also hosts the Know Your Rights Camp for youth to get educated on how to interact with law enforcement. Kaepernick was featured on the cover of the October 3, 2016 issue of “Time” magazine. Goes Scorched Earth On Kap ... You're a Sellout!! !